/Shipping & Delivery /About My Account /Can the site save my mailing addresses? Our site can maintain several addresses, and you also have the option to save addresses into different groups. These addresses can be easily added, altered, or deleted from the Address Book tab from your Account’s Dashboard. When you click on “Address Book” from your Dashboard’s toolbar on the left side of the screen, it will take you to a page where you can add, delete, and manage addresses in your Address Book. 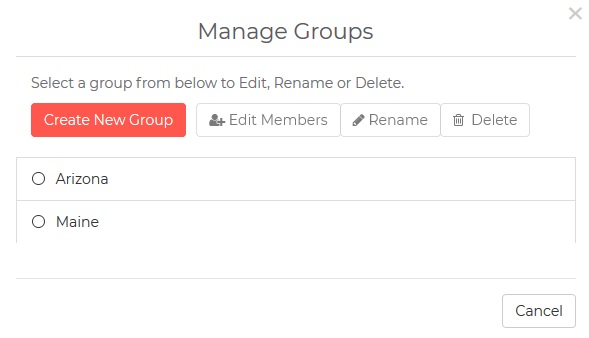 To add an address to a group, click on that address’s selection box on the left, and then click Manage Groups. This will bring up a window that will prompt you Create a Group, Edit Members of that group, Rename a group, or Delete a group. From there, you can place this address into your “Arizona” group, or your “Maine” group. When it comes to adding a whole list of addresses for your cards or invitations, you can either manually enter them into our system, or you can Import Contacts from an Excel Spreadsheet, or from Gmail. You can also choose to Collect From Recipients, which generates a link you can share on your social media page or e-mail for your recipients to enter their contact info for you. You can find these two options on the same Address Book page. If you ever have any questions about your information and how it’s kept, our support team is here to help.